If you enjoy authentic Korean kim chi, I think you'll find this recipe for Kim Chi Fried Rice right in your wheelhouse. Talk about mouthwatering bursts of flavor with every spoonful. 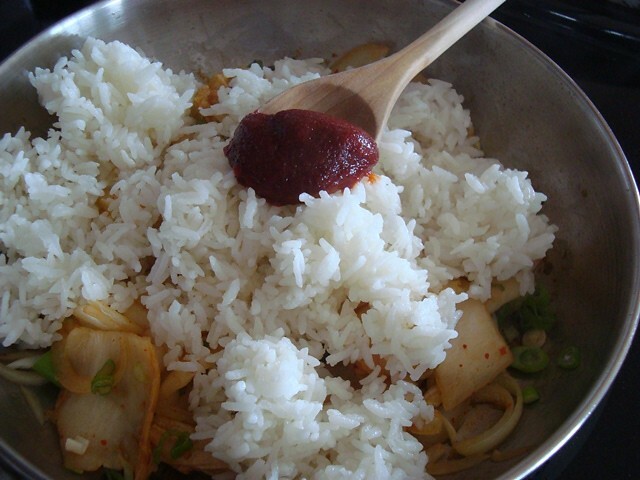 Once you have some rice and kim chi ready to go, the whole dish takes no more than about ten minutes from stove top to your kitchen table. If you don't have time to make your own kim chi, you can always pick up a jar at a local Korean grocery story. You also need some cooked rice. 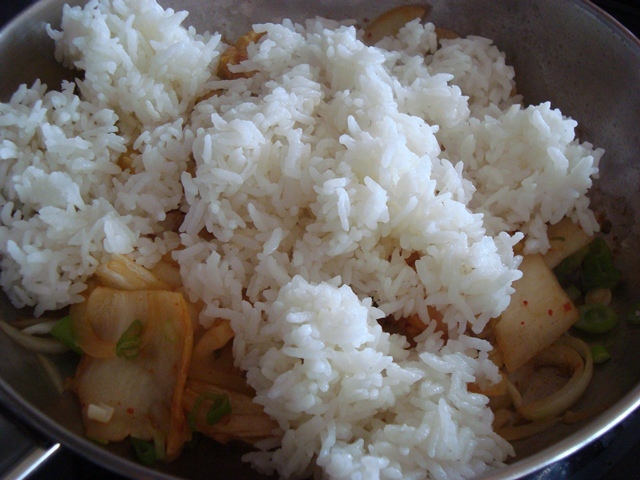 To make two to three substantial portions, cook up two cups of rice. For traditional mouth feel, it's best to use calrose (sushi) rice, though any variety will do. If you use calrose rice, use two parts rice with two parts water, but let the rice soak for about thirty minutes prior to cooking. 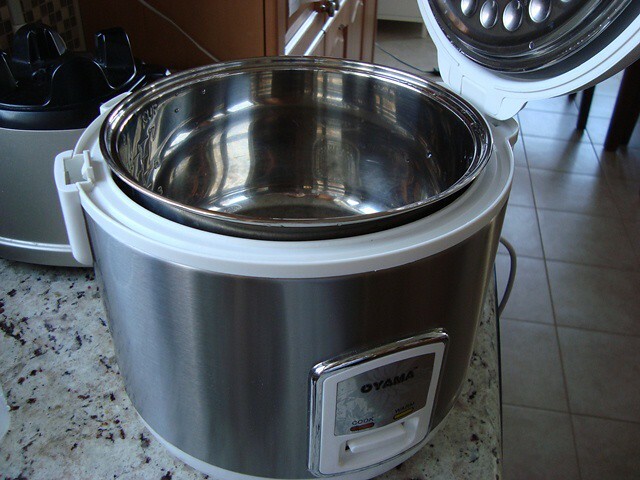 These days, we use the following stainless steel rice cooker that Margaret found through Amazon.com. 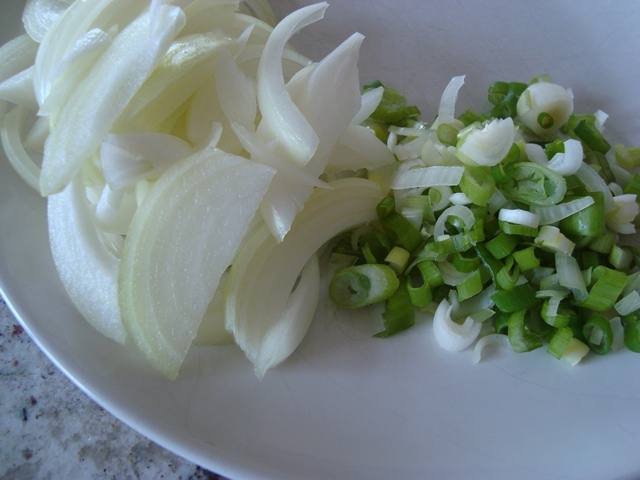 Once you have some kim chi and about 3 to 4 cups of cooked rice ready to go, chop up one medium to large yellow onion and one to two green onions. 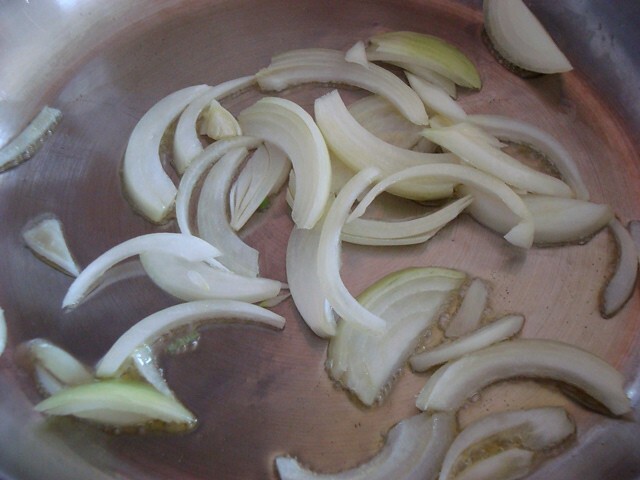 Begin sautéing your yellow onion slices in olive oil over medium heat in a large pan. Add a cup and a half to two cups of kim chi to your onions - no need to allow the onions to cook on their own for any length of time. The onions and kim chi can sauté together. Stir and let cook for a good three to five minutes or until the onions start to become translucent. Then add your green onions. If you have some minced garlic on hand, you can add a good teaspoon at this point. Next comes your cooked rice - about three to four cups. If you have some sesame oil on hand, add a good teaspoon at this point and give everything a really good mix. You want your go choo jang to get evenly distributed throughout. Best to serve it up while it's steaming hot. Garnish with some sesame seeds if you have some in your pantry. And that's it. Perfectly authentic Kim Chi Fried Rice that'll make any Korean grandmother swoon and give you a few congratulatory slaps on your back. If you're feeling like a boost of healthy protein, serve this up with a sizzling fried egg on top - this is how it's typically done in Korean restaurants. If you have any comments or questions, please feel free to ask away via our comments section below. 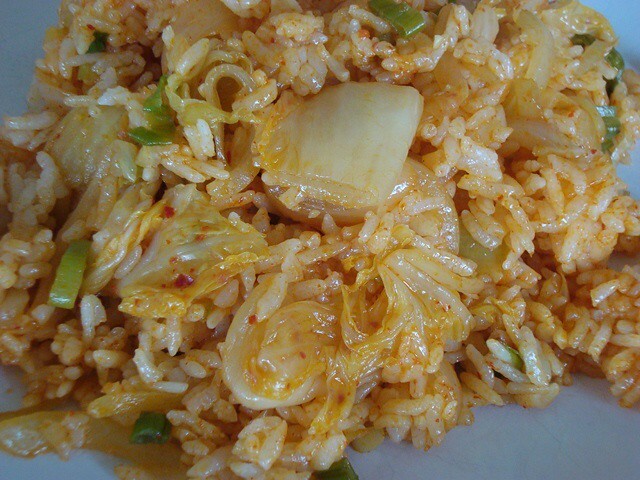 Hi there - I have never tried Kim Chi Fried Rice - but your lovely pictures make it look very appetizing! I didn't even know what Kim Chi was, so I looked it up - - and found that there are several varieties. So, my questions to you are - - which variety did you use, is the dish quite spicy, and is go choo jang (a thick, fermented chili paste - sounds hot!)spicy? 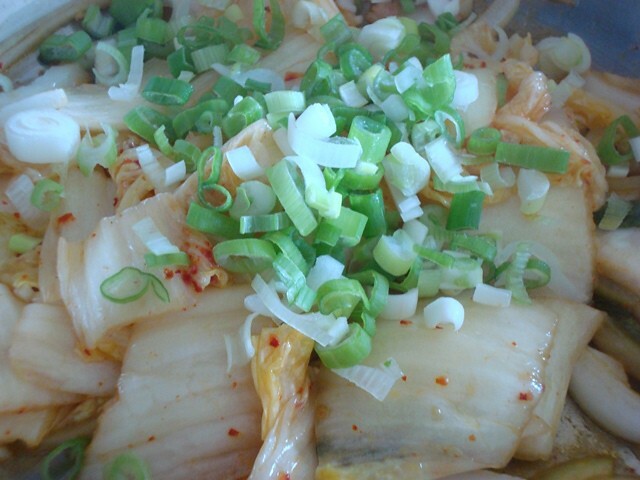 If you scroll up to the top half of this post, you'll see a link to a pictorial on how to make kim chi using Napa cabbage, which is the most common type of kim chi in Korean cuisine, and happens to be my favourite variety. 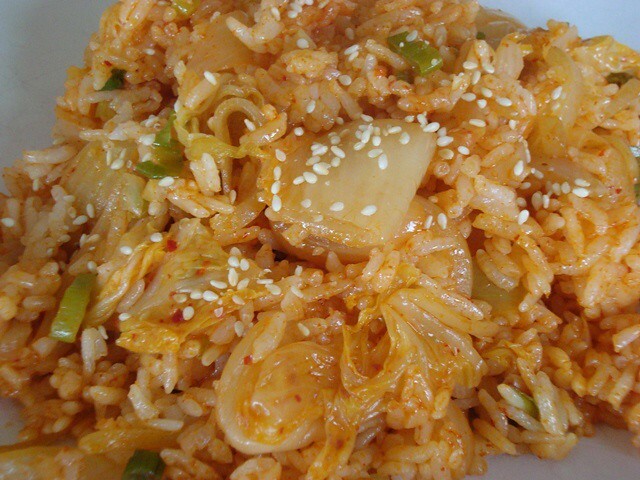 If you go to a Korean restaurant, you can ask for "kim chi bok kuhm bap," which is Korean for kim chi fried rice. I would ask for a fried egg on top. i have been experimenting making my own gochujang to avoid the fillers. i start with gochugaru--red chili powder from the korean grocery, then mix it with rice vinegar, chang girum--roasted sesame oil, maple syrup or honey, some water. it's very spicy and a little thin, so it could use a thickener, which i haven't figured out yet. also found a nice short grain brown rice that behaves like calrose. thanks for the inspiring recipe, and all your great ideas and insights on health, dr ben! i fwd them all the time to my adult kids. That's great Peggy. My mom likes to make her own by using miso as a base, then adding some sesame oil, very fine ground red pepper powder (go choo ka roo), and a touch of our raw honey. I'd add a little miso to your combination and see if this thickens it up. Good luck. Thanks for sharing so many great recipes! I've learned to make a lot of my staples from your blog. Thanks Anna! These days, my mom buys her go choo jang at the Korean grocery store. I haven't tried making it on my own. I hope it works out well for you! Could you please tell me what brand/type of brown rice you have had success with? I am not Peggy but I saw your post & decided to answer with the rice I use. It is 100% whole grain and also grown in CA. Name is TSURO MAI. Hope you find it. I don't know if this would work but I wonder if sweet potato starch could help thicken up your homemade gochujang. Kim Chi is very hot. How much chili paste to cut down in order to make it mildly hot? Borgny, best to experiment and see what suits you. Start with just half a teaspoon and go from there. You can always add more if needed. Good luck. This sounds wonderful. Growing up with a Korean step-grandmother, I came to cherish the tastes and smells of Korean cuisine from an early age. 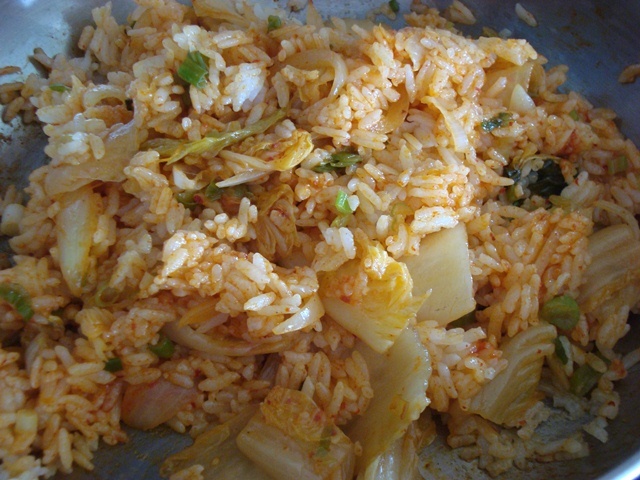 I have made kim chi on several occasions but never thought of using it in fried rice. This is definitely a must try! Thanks, Ben! I love your newsletters. You always have informative posts and tasty recipes. How is the nutritional value of kim chi affected by cooking? I had always tried to eat it raw. Looks tasty, though. You'll lose some enzyme content. But most of the nutrients should remain intact and available for your bloodstream. I eat a combination of raw and cooked foods. Hope you get to try it, David! Doesn't cooking the Kim Chee destroy the beneficial probiotics that it contains? Yes, you will also lose most of the probiotic benefit. For maximum value, kim chi is best eaten raw. But to have it cooked once in a while in fried rice or in a stew is still beneficial to health for its many other nutrients that are not heat sensitive. Thanks for the recipe...I've been looking for one. My two youngest children are in Korea and always talk about Kim Chi and how they love it...so now I'll try making it. One question: should the teaspoon of sesame oil called for be plain or toasted sesame oil? I want to try this! Thank you very much for sharing such a delicious and easy recipe. Hi Rachel - both will work. Hi Rachel - both will work. We typically used roasted/toasted. Good luck! Does the rice have to be cold for this recipe? Most fried rice recipes call for cold rice. I love Kim Chi. My Korean American sister in law grew up in Korea. She's an excellent cook in general, but her Korean cooking is wonderful. I like Kim Chi fresh out of the mixing bowl, or at the most the next day after making it. Hi Deb - yet another great feature of this recipe is that you can use cold or hot rice. Both work equally well for us. :) Enjoy. Most of us are not that familiar with Korean food. It would be helpful to explain what kim chi is or what kind of cabbage (if that's what it is) could be substituded that is in American mkts. Could you possibly recommend a good brand of go choo jang that does not contain MSG? Thank you! I really enjoy your recipe pictorials. I'm sorry that I'm not familiar with the various brands out there. We use homemade go choo jang that my mom gives us about once a month. If you go to your local Korean grocery store, you should be able to get some helpful guidance on this. Hope things are great up there in AK! Thank you, Dr. Ben! It is finally Spring In AK and we are so happy! The grass is turning green and the leaves are budding out on the trees. There are even a few flowers out. SO beautiful! Thank you for the go choo jang info - I just saw the posts that tell how to make it at home, so I'm going to try that! I'm really enjoying your pictorial recipe posts. The pictures are so clear, and, when appropriate, close-up enough to really see what's going on. I also appreciate the video bits that clarify even further how to do that particular step. Very handy! I'm allergic to soy. Does Kim Chi have soy in it? If so is there a substitute I could use? No worries - kim chi does not contain soy. I sub quinoa in almost every rice meal and this is AWESOME :) Thank you again Dr. Ben Kim! Thank you for the recipe - I often use Korean Rice cakes ( very different from American puffed rice cakes :)) in this recipe for a slightly different feel( you need to add water and simmer them a bit). 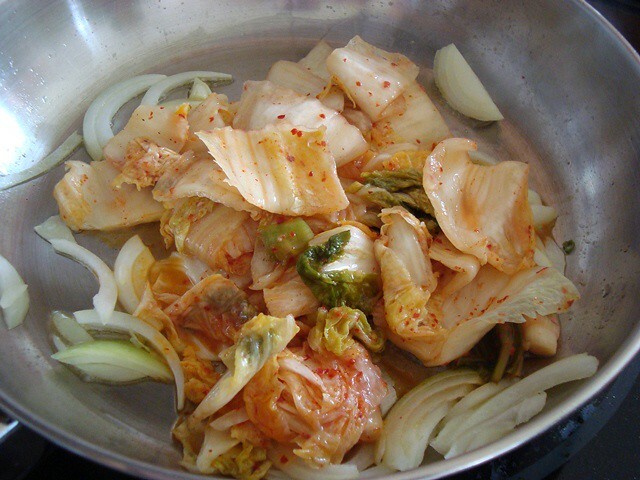 I also add a great deal of julienned fresh ginger and plain shredded napa cabbage along with the kimchi and scallions. WE really enjoy it - Am I doing an unhealthy thing by adding the cabbage and ginger? Is there a reason to not use the Rice cake?